It’s that time of year when your luscious green grass starts to dry up and become crunchy and brown. It doesn’t look very appetizing, so why would your chickens want that? Wouldn’t you want a fresh green salad all year round? Well, HELLO FODDER!!! 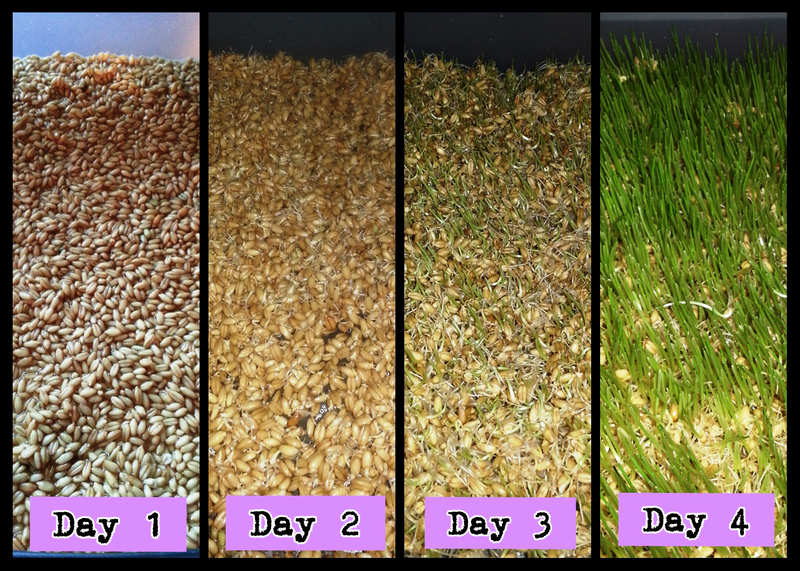 Sprouting fodder for your chickens is similar to growing sprouts for human consumption. It’s relatively simple and quick to do! Did I say quick? It only takes 6 days for the nutritional benefits to max out. 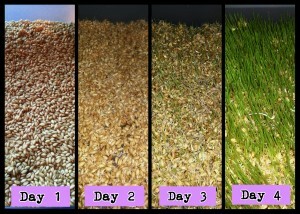 This is a fun project for kids, too, because the fodder progression is so quick! It doesn’t even take a week to have results like this. 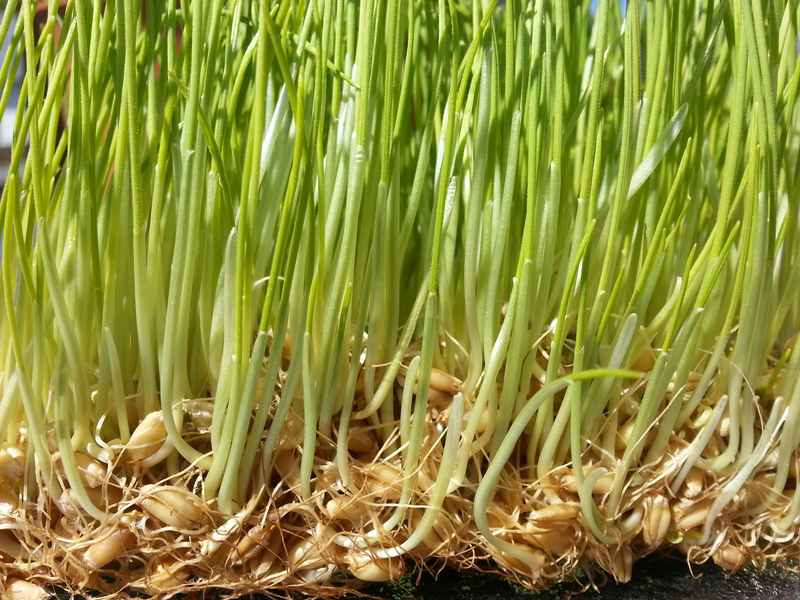 BARLEY: (Easiest to sprout) If you use barley for your fodder make sure that it is UNhulled. ‘Unhulled’ barley simply means that the hull (husk) is still intact and whole. It still has the germ which in turn will germinate, allowing it to grow and sprout. ‘Hulled’ or pearled barley will NOT sprout. WHOLE WHEAT: There are different varieties of wheat berries to purchase, including Hard Red Spring/Winter, Hard White and Soft White. Don’t let all the varieties scare you! They all work the same for fodder. WHOLE OATS: Whole oats are the cheapest usually, yet the hardest to grow. Oats tend to have a lower yield in the end and less nutritional value than barley and wheat. However, if you prefer to experiment with the oats make sure they are WHOLE oats and not rolled. 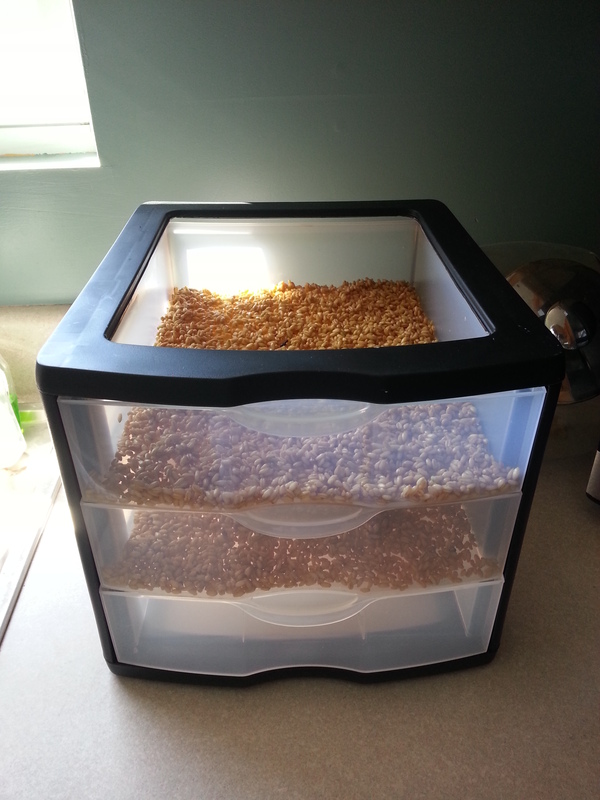 All you need to start your sprouts is the grain of your choice, a sprouting tray and water! That’s it! No need for any dirt. There are many sprouting trays you can purchase but if you want to go the inexpensive route you can make your own. You can use anything that is about 2 inches deep. Don’t forget to allow good drainage and airflow to prevent molding. Poking small holes is a must. You don’t want them to sit in any water. It’s also a good idea to put a drain tray under the sprout trays to catch the water during rinsing time. The option most convenient for me was the stacked drawer system. I used a plastic drawer storage bin that you can purchase at any store. I cut a hole in the top to allow ample air flow, poked holes in the drawer for drainage and left the bottom as is for my drain tray. With using the drawers you can to start the sprouts at different days, allowing you to rotate the drawers. 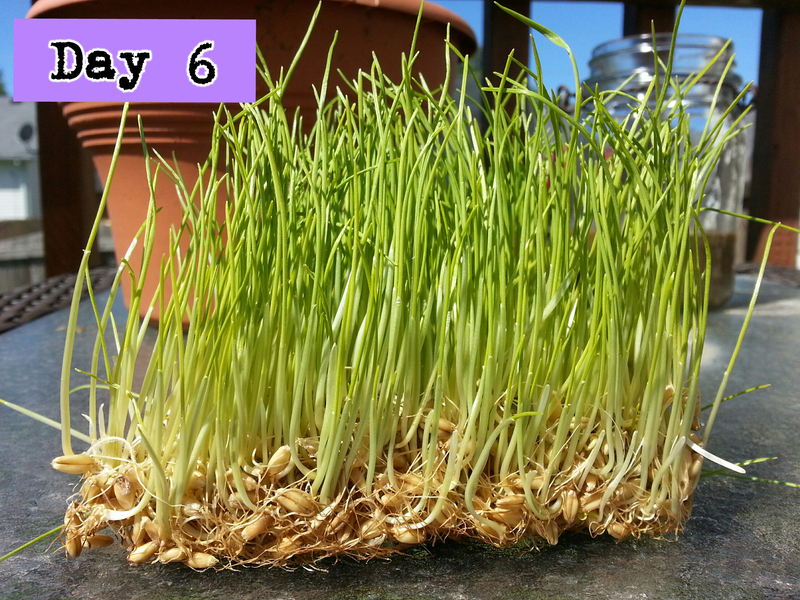 So now that we have our fodder system in place, let’s get to sproutin’! Take the grain of your choice and soak them in a bowl overnight. Usually about 12-24 hours is sufficient, but no more. 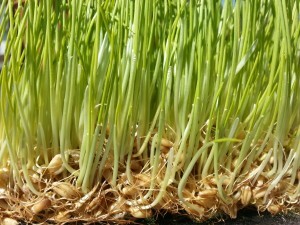 Once they have soaked be sure to drain them thoroughly and place them in your sprouting trays about ¼ inch thick. Day 1 is the day you place them in the trays. You will need to rinse and drain the grains twice a day. 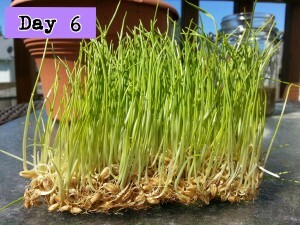 I usually do not grow sprouts/fodder past day 6. Any more than 4 inches tall is a risk for impacting a crop. Oh crop, that’s not good! At Day 6 I pull the fodder out of the trays and scatter the clumps throughout the run or yard. The great thing about growing sprouts is that you don’t need any special lighting. AND they are to be grown at room temperature—easy! Not to mention all the great benefits for your flock. Sprouting the grains amplifies the great nutrients, proteins, vitamins, and digestive enzymes, all of which improve the health and energy of your flock, resulting in a rich yolk color—not to mention a delicious taste. I found your blog via Blog Lovin’ and I am so excited about your fodder post! I have a 3 drawer container that will be perfect! I am a fairly new chicken mama (we got our first flock of 6 on May 11th) and I love, Love, LOVE them so far! Thanks for the great tutorial! Happy Chickening! Stephanie, Congrats on your new flock! They are so fun and provide hours of entertainment! I have found the 3 drawer system works best for me and my flock. And you will be amazed at how easy they are to grow! Enjoy! Where is the best place to get starts seeds for fodder? The best place to find a large variety is usually online. I have also purchased them before at a local health food store and also a farmers market and local produce co-op in our area.